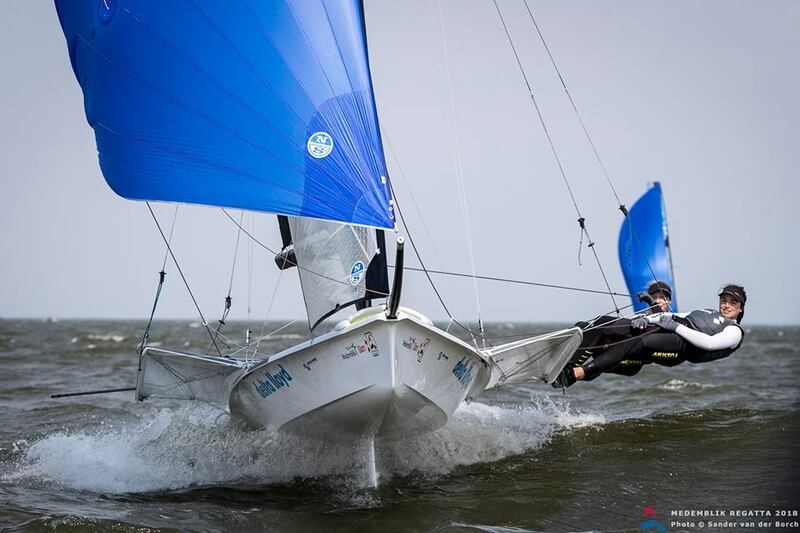 Dutch sailor Annemiek Bekkering and her crew Annette Duetz put on a scorching display in their 49erFX to secure second place in the Medemblik Regatta which concluded last weekend. The Dutch team had taken delivery of a brand new boat a couple of weeks earlier – they get a new one every couple of years – and spent five days setting-up the rig to their preferred arrangement, followed by five days of sea trials …then they were ready to go! Medemblik is an historic town about 40km from Amsterdam. It offers protected seas to watersports enthusiasts and race competitors alike in all conditions except winds from the East – which was the prevailing wind direction during the regatta! Fortunately the wind was not too strong. In fact it was the light wind conditions on all race days but one which made this a very technical race for the competitors. 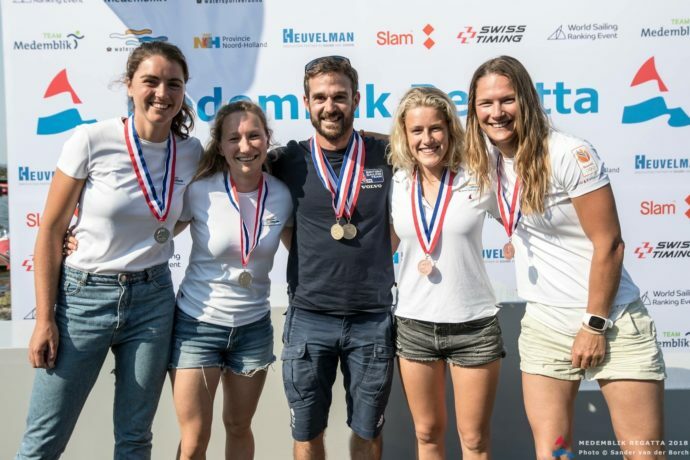 You may remember that at her last event – the World Cup Series in Hyères, France – Annemiek was frequently disappointed with the position they achieved as they crossed the start line. For the Medemblik event they concentrated a lot of their effort on achieving great starts …and succeeded in that ambition 90% of the time. It was their over-enthusiasm in this regard which earned them a disqualification in one of the heats! What Annemiek aims to do is to cross the start line, at full speed, one millionth of a second after the gun has gone off. That’s a pretty fine-call! She misjudged it on one single occasion, flying across the line slightly before the gun, and paid for the mistake by being excluded from that heat! Women L – R : Annette and Annemiek share the podium with compatriots Odile van Aanholt and Marieke Jonges who won bronze. The man in the middle is the British coach who received the medals on behalf of first place winners Charlotte Dobson and Saskia Tidey …who had to catch a train! Each heat lasts for about half an hour, there are 12 of them during the event, and the competition is fought between 24 teams – so there is plenty of opportunity for a determined team to make up for past errors, and climb back up the table. Hence the superb performance from Annemiek and Annette which achieved for them second place in the event. Look out for Kieler-Woche 2018 Germany in a couple of weeks time – we’ll bring a report from that event. 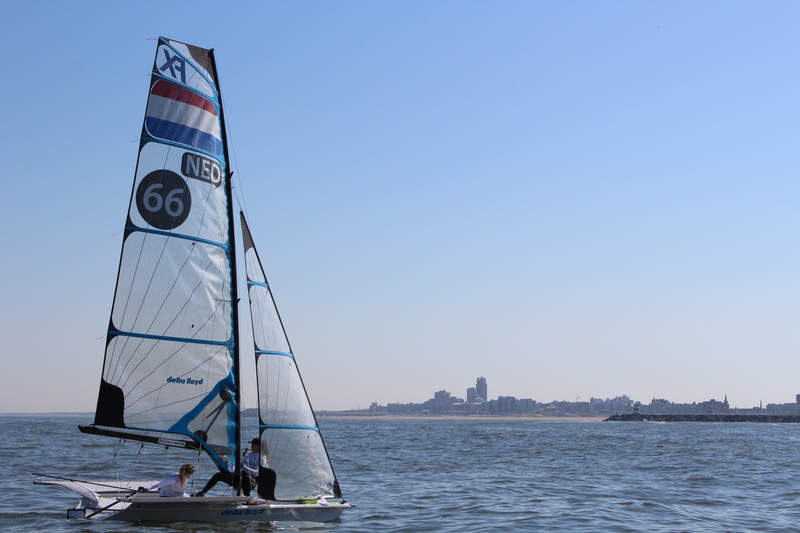 Victron is proud to support Annemiek Bekkering as she strives for excellence in her sporting career.